Garlic is a long season crop, 180-210 days to maturation, depending upon the variety. So as you may imagine, the proper fertilization of garlic is of paramount importance. The question is not only how to fertilize garlic, but when is the best time for feeding garlic plants? Garlic is a heavy feeder, basically because it takes so long to come to fruition. Because of this, it’s best to think about feeding garlic plants right from the start. In most climates, garlic bulbs should be planted in late fall or early winter — six weeks before the soil freezes. In milder areas, you may plant garlic in January or even February for late summer or early fall. 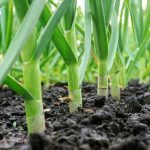 Prior to either of these planting times, you should amend the soil with plenty of compost, which will become the basis for fertilizing your garlic as well as aid in water retention and drainage. You can also use manure or 1-2 pounds of all purpose fertilizer (10-10-10), or 2 pounds of blood meal per 100 square feet of garden space. Once the garlic has been sown, it is time to consider a schedule for further fertilization of garlic. Fertilization of garlic plants should occur in the spring, if you planted in the fall. Fertilizing your garlic can occur either by side dressing or broadcasting fertilizer over the entire bed. The best garlic plant fertilizer will be high in nitrogen, those containing blood meal or a synthetic source of nitrogen. To side dress, work the fertilizer in an inch down or so and about 3-4 inches from the plant. Fertilize every three to four weeks. Fertilize your garlic again just before the bulbs swell, around mid-May. By all accounts, however, do not fertilize with high nitrogen foods after May, as this may stunt the bulb size. Keep the area around your garlic weed free since it doesn’t compete well with weeds. Water the garlic deeply every eight to 10 days if spring is dry but taper off in June. Start checking for mature cloves at the end of June. It’s best to dig one out and cut it in half to check for maturity since the green tops of garlic don’t die back like other Alliums when they are ready. You’re looking for plump cloves covered with a thick, dry papery skin. Cure bulbs in a shaded, warm, dry and airy place for a week. 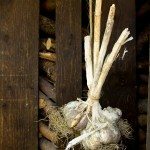 Garlic can be stored for months in a cool, dry, dark area. Cold temperatures promote sprouting, so do not store in the refrigerator.